Perfect Sunsets, Direct Gulf View with 2015 Remodel! Complete Bathroom Remodel in 2015! This 10th story, direct gulf view studio (pull across divider to separate bedroom from living room with gueen sleeper softa), is part of the Estero Beach & Tennis Club located at 7300 Estero Blvd on the quiet south end of Estero Island. It has a stunning view of Estero Bay & Sanibel Island. We are located directly across the street from Santini Marina Plaza which houses plenty of shopping, a drug store, a book store, U.S. Post Office outlet, a hardware store, a bank, several restaurants & a marina with boat/fishing rental. There is also within walking distance additional shops & restaurants, & a golf course with driving range. JSL stands for Johnson, Sandager & Lagermeier. 3 families (2 sisters & 1 brother along with our spouses) own the unit. We all live in Minnesota surrounded by our children & grandchildren. Over the last 3 years, we have been updating the unit. New kitchen, furniture & just in 2015 a complete bathroom remodel. 10th floor, direct gulf view - can't beat the view! 2012 brand new kitchen, carpet/flooring & updated bathroom. A 42" flat screen TV with cable, DVD player, stereo, fold out couch that sleeps 2, all bed linen & bath towels, & the kitchen is equipped with microwave, coffee maker, toaster, cook & dinnerware. Outdoor gas grills, a large beachside heated pool (a lounge area is adjacent to the pool with plenty of chairs for relaxing under the palm trees), 4 clay tennis courts & a laundry room on the first level are there for quests only to use. Truly a tropical & exotic feel on 10 manicured acres of lush lawn with beautifully planted shrubs & flowers. This unit is located 10 miles from the Southwest Florida International Airport. Right from the unit's balcony you can enjoy unbelievable sunsets where you might catch a glimpse of the green flash. Very nice unit - would totally stay again! New bathroom & kitchen. Comfortable bed & furniture. An amazing California closet too. Walking distance to may bar, restaurants & shopping. I got married on Fort Myers Beach 2 years ago & we spent our Honeymoon at this unit. I've been staying at this unit for over 10 years & have never been disappointed. Best view ever! The accommodations are always being updated (new furniture, kitchen, bath & walk-in closet). The owners are friendly & always available if needed during our stays. We'll be back next year! Loved our stay at the condo. 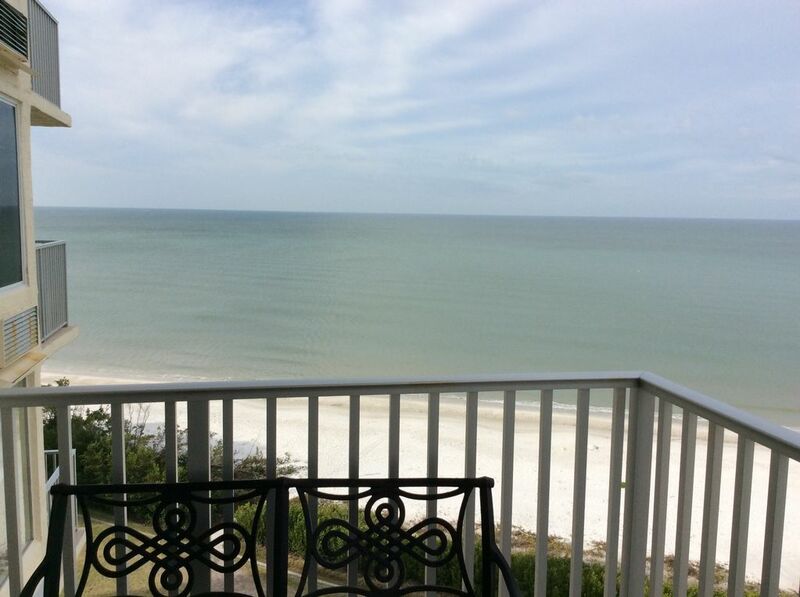 The view from the balcony of the Gulf and beach is just awesome! The kitchen and bathroom are beautifully updated. We loved listening to the waves, seeing dolphins and searching for seashells. We will return in the future! A comfortable, well maintained condo in a well maintained high rise complex in a great, quiet area of Fort Myers Beach. Beautiful view of the gulf from the balcony with plenty of seating. Jane was fun to work with and gave us suggestions of places to go for our first trip to this area! We will be returning to this lovely condo! Thanks for the lovely review. We are so glad that you had a wonderful time. We look forward to seeing you again! Enjoyed the modern kitchen & bathroom. Great walk in closet! King size bed was very comfortable. The beach supplies (chairs, umbrella, cooler, ...) were used a lot. Even though we had a car, we used the Estero Blvd trolley too to get down to Time Square several times. Very convenient to have a CVS & Publix close to your unit. It took a while to figure out the recycling process (must hand carry it down to the back of the building) - might be helpful to inform your renters of this. We would stay in your unit again. Great! Thank you for your review. Our guest's happiness is number one on our to do list. plenty to do right on Ft Myers Beach! Nightly Rate: $186 - $215 Weekly Rate: $1300 - $1505 Monthly Rate: Negotiable May 11, 2019 - Summer 2019 $1,100/week September 21, 2019 - April 11, 2014 $1,505/week. April 11, 2020 - June 6, 2020 $1,450/week. June 6, 2020 - September 19, 2020 $1,100/week. There is a $120.00 cleaning fee per visit. You can use your credit card & pay us through PAYPAL - just ask for a PAYPAL invoice. Checks & money orders are also welcome.